gatorade Archives | Food blog! 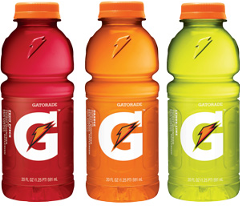 The Best 10 Gatorade Flavors List below contains seventeen of the most popular flavored sport drinks offered at your local market. Most of the variety in flavor is dominated by fruit infused creations such as Rain Berry and Fruit Punch. However there are tastes to suite all tongues in the US and abroad those flavors include some of the more tropical mixtures including Mango Extremo and Lemon Lime two of the most thirst quenching flavors offered.